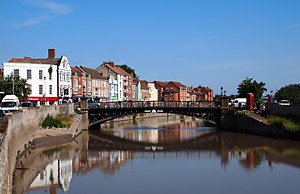 Bridgwater is a small town located some 37 miles (60 km) south of Bristol and 10 miles (21 km) from the mouth of the River Parrett. 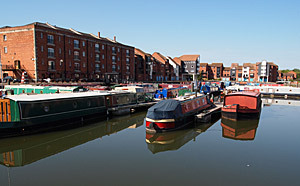 Until the river silted up Bridgwater was quite a busy port and the town retains its old quays, a canal link to Taunton and a reputation for industrial enterprise. Bridgwater has a long and somewhat defiant history. When Alfred the Great was supposed to be burning those famous cakes, he is thought to have been hiding from his enemies somewhere in the nearby marshes. In the 11th Century, the great Norman castle that once guarded the river crossing was held by the Barons against the King. During the Peasants' Revolt of 1381 some of the locals rose up and went on a killing spree directed against the local tax inspectors. 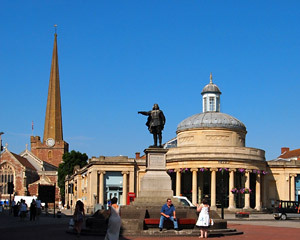 In 1865, the Duke of Monmouth was declared king in Bridgwater. Unfortunately for him he went on to lose the nearby battle of Sedgemoor and finally lost his head at the Tower of London. Even Guy Fawkes is regarded as a superstar in Bridgwater and a marvelous carnival is held annually to honour the man who attempted to blow up parliament. Bridgwater was once known for its traffic jams but the M5 has since bypassed the town leaving it a pleasant place to visit. There are some elegant streets and well-preserved old buildings. A statue of Bridgwater's most famous son, Admiral Robert Blake, stands at the Cornhill and the house where he may have born is preserved as a museum. The major event in town is the illuminated Guy Fawkes Carnival, a magnificent and colourful spectacle which draws thousands of spectators to the town each year. The parade has over a hundred floats lit by thousands of electric bulbs and takes 2 or 3 hours to get around town. Later in the evening, large fireworks known as "Squibs" are set off outside the Town Hall. The museum is housed in the restored 17th Century home of the Blake family. In addition to outlining the life and career of Bridgwater's naval hero, there are a number of galleries each exhibiting a different aspect of past and present life in Somerset. The arts centre can be found in the Georgian Castle Street. It functions as a community arts venue for both the visual and performing arts. There are regular art exhibitions and performances. This museum tells the story of brick and tile manufacturing which was once a major industry in Bridgwater. The museum is located in the former Barham Brothers Brickworks site and contains the last remaining tile kiln. The canal opened in 1827 to link the two towns. It no longer serves a commercial purpose but now provides opportunities for boating and for pleasant walks along its banks.